The U.S. economy accelerated at the beginning of the year, but don't get too excited. Economists aren't very optimistic that trend will continue in the months ahead. Gross domestic product -- the broadest measure of economic output -- rose at a 2.5% annual pace in the first three months of the year, driven largely by a pick-up in consumer spending, the Commerce Department said. Consumer spending, which alone accounts for roughly two-thirds of GDP, rose at a 3.2% annual pace, the fastest pace since the end of 2010. At first glance, that's pretty remarkable, since most workers saw their take-home pay drop in January, following the end of the payroll tax cut. But the data also shows that consumers funded that spending in part by saving less. 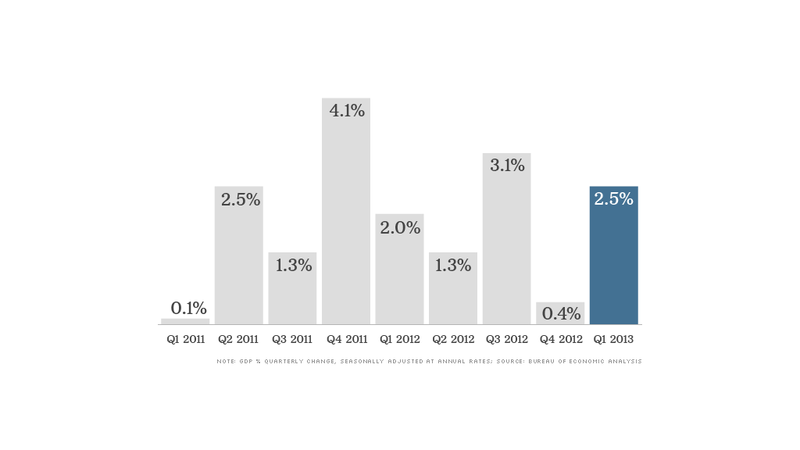 Americans saved an average of 2.6% of their disposable income in the first quarter, down from 4.7% at the end of 2012. "Households are drawing down savings, and they are borrowing to continue spending," said Steve Cunningham, director of research and education for the American Institute for Economic Research. "That won't last forever." What were people buying? Primarily, more services. That too could be partly temporary in nature. Americans spent more on housing and utilities, which rebounded after slumping following Hurricane Sandy in the prior quarter. This March was also the coldest since 2002, a weather patten that boosted the demand for heating. Consumer spending on durable goods like autos also contributed to stronger economic growth, but to a lesser extent. On the business side, investment in equipment and software added slightly to growth. An even bigger boost, however, came as businesses restocked their shelves and warehouses after drawing down their inventories in the fourth quarter. That effect is also likely to be temporary, Cunningham said. Meanwhile, cuts in government spending, mainly related to defense, dragged on the economy in the first quarter. The last two quarters marked the biggest six-month contraction in the federal government's economic activity since the months following the Korean War, which ended in 1953, noted Paul Ashworth, chief U.S. economist of Capital Economics. Spending by federal, state and local governments is now lower than it was in mid-2007, before the recession began. Given the fiscal squeeze, Ashworth said it's rather impressive that the economy still grew 2.5% in the first quarter. Since the recovery began in mid-2009, the economy has grown an average of 2.1% a year. Once you strip out the government's spending, though, that growth looks more like 3.1%. "It's becoming more and more clear that the public sector is the real thing holding the economy back now," he said. Public-sector cutbacks are likely to continue dragging on the economy through the rest of the year as the federal government alone cuts $85 billion over a seven-month period. Economic growth isn't likely to be as strong in the second quarter. Other economic data already shows the economy may have lost some steam starting in March. Job growth slowed, retail sales slumped and the manufacturing sector showed signs of weakness. Overall, the first quarter GDP report was a bit of a letdown. Economists had been expecting the economy to grow at an even stronger rate of 2.8%. "Even this weaker-than-hoped-for growth rate exaggerates the true underlying momentum in the economy," said Chris Williamson, chief economist at Markit. U.S. stocks were mixed Friday morning, following the report.